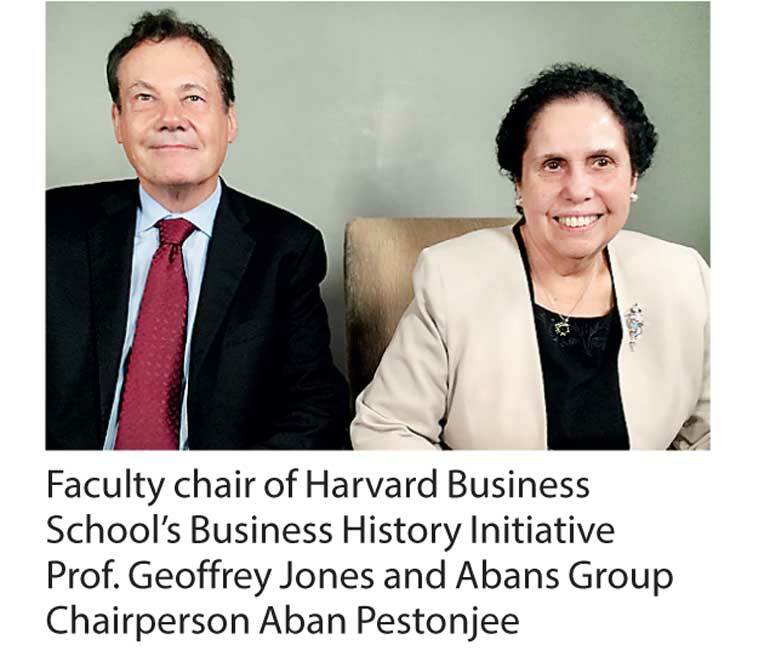 Aban Pestonjee, founder chairperson of Abans, was invited to be interviewed by Prof. Geoffrey Jones, the faculty chair of Harvard Business School’s Business History Initiative, on the topic of ‘Creating Emerging Markets’. This is a singular honour not only for Mrs. Pestonjee and Abans but for Sri Lanka. The Harvard Business School is the graduate business school of Harvard University in Boston, Massachusetts, the US, and is one of the world’s most prestigious business schools from which global corporate leaders receive their MBAs and doctorates. The two-hour-long video interview was a sit-down discussion between Prof. Jones and Mrs. Pestonjee and was conducted at the Sapphire Room of the Taj Mahal Palace Hotel in Mumbai. The full transcript of the interview will be kept in the archives of the Harvard Business School’s Baker Library and will become a part of the library’s Historical Collection and ‘Creating Emerging Markets’ website and will be available to students for research and case studies. The interview, which received comments of wide acclaim from those present at the recording, covered many topics such as ‘The process of innovation in the business’, ‘The acquisition of international technologies’, ‘The role of family’, ‘The issue of succession’, ‘The recruitment of professional management’, ‘Relationships with government, NGO’s and international organizations’, ‘Responsibility for society and natural environment’ and the ‘Challenges and opportunities of globalisation including globalizing brands’. The phenomenal success of Abans from a small retail shop selling used home appliances to the market leader in electronics and household appliances with 30 independent companies in the diversified fields of business and services and a network of over 400 showrooms, dealers and service centres island-wide is a remarkable achievement. Abans’ newest venture is the multibillion rupee Colombo City Centre, a mixed development project on Sir James Peiris Mawatha, Colombo 2 overlooking the picturesque Beira Lake. In keeping with their policy of always looking to introduce new technology to Sri Lanka, Abans has ventured into developing the first ever lifestyle mall and mixed development project, the likes of which are only found in highly developed countries like Dubai, the US and Singapore. The mall will feature attractions for tourists as well as locals who can come and spend an enjoyable day with their families. Being an impressive piece of innovative architecture and engineering, the 48-storey lifestyle centre will feature a contemporary lifestyle retail mall, an upscale hotel operated by Next Hotels – the flagship brand of SilverNeedle Hospitality and opulent apartment residences. The high-calibre retail mall will feature a range of global brands that will promise a never-before-seen shopping experience to Sri Lankans. The centre will also feature a six-screen multiplex with the best movies throughout the day, an international food court and various unique entertainment and leisure activities that will provide a radical take on how Sri Lankan families and tourists could spend the whole day relaxing and enjoying themselves.